Appearance (0-20): The deep outer wrapper looks nearly perfect, enticing you with the rich tobaccos that are within. In beautiful contrast to it stands a simple red and white label, proclaiming it a Tatuaje. The band itself is understated, allowing the nearly vein free cigar do all of the talking. This cigar looks really good. Construction (0-20): Picking up the cigar, I was surprised to find that it was somewhat soft to the touch on the exterior. The wrapper felt silky, while putting any pressure on it revealed that it had the perfect amount of tobacco in there (with some give of course). 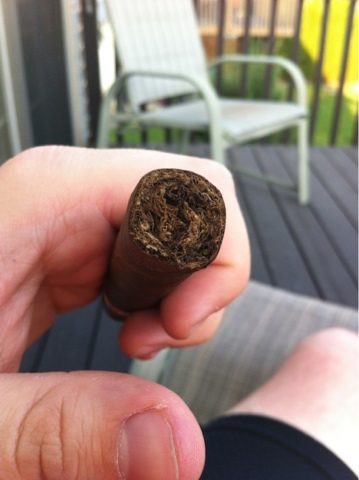 The foot revealed a nice amount of ligero with very little tobacco residue upon the cut. Smoking it was a pleasure, as the draw was perfect, the ash held very well (sticking on for nearly half of the cigar before having to drop it off), and the burn was amazingly straight and cool. Strength (0-20): Medium is where it’s billed and medium is exactly where it sits. In fact, I don’t believe there was any point in the cigar that I felt it deviated – middle of the road the entire way. Flavor (0-20): There is some initial pepper to greet you along the way, but it’s merely just a greeting and fades back quickly into the background (evident on the retrohale but not as forceful on the inhale). Leather and wood were the main drivers from there and through the first third, but it incorporated slight sweetness to even things out. The next third didn’t really change very much, other than adding a bit of a nutty flavor that eventually overpowered the leather… Ditto to the final third, although there was a bitter flavor that added to the sweetness from earlier. The flavors were pretty well pronounced throughout; however, it lacked the additional complexity I was hoping for. Still, it was a very good taste. Value (0-20): $6.75 is a pretty fair price for Havana VI, but its not earth shattering. The price is neither a bargain nor a dud. Additional Notes: Smoked on my deck, paired with coffee. Overall (0-100): Thusfar I have been relatively impressed with the way Tatuaje produces cigars. They are constructed well, flavorful, and honestly there has been nothing majorly negative to say about them in general. This particular smoke was one that hit the above characteristics, but I don’t think its spectacular enough for me to warrant this to be any higher and the score it was given. 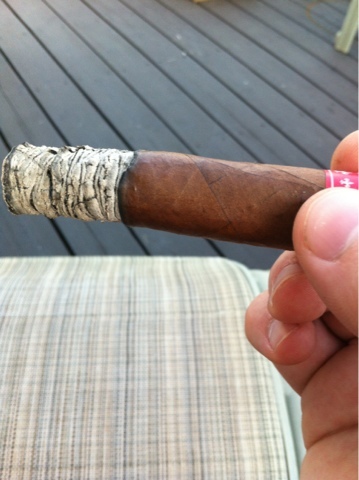 I enjoyed the flavor, but wanted more complexity… and I would smoke this again, but wouldn’t go out of my way to get one. It’s a tricky conundrum really – it’s worth smoking at least once, but personally I don’t think it’s worth rushing to the store for.